Your virtual summit needs checklists. or I would make the same mistake that I made in a previous summit. I wasted countless of hours because I wasn’t truly learning from the mistakes I had made. That is…until I started creating checklists. What exactly is a checklist? Well I’m glad you asked. A checklist is exactly what it sounds like – I list of things you need to do to help you be more successful. For example, when I realized that waiting until the end to start creating promotional materials was more efficient, I added that to the end of the checklist. See sometimes speakers would be interested in the summit, but won’t show up, or some speakers would indicate interest at the last minute. So if you had already created the promotional materials, then you would need to recreate every single one, because now you need to remove or add names and pictures. As you can imagine, I only had to make this mistake twice before I realized that it would be a more efficient use of my time if I just waited until closer to the launch of the summit to create the promotional materials. In the virtual summits I have launched and helped others to launch, I have learned so many little things like that, and now when I look at my checklists I don’t have to keep making the same mistakes. Atul Gawande in his book – The Checklist Manifesto talks about the importance of checklists when saving patients. While it may at first seem like a nuisance, it can save time and lives. While your virtual summit may not be about saving lives, if you’re interested in saving time, then you seriously need to consider creating a checklist. If you’ve never created a virtual summit before, and you’re not sure where to start with your checklist here are a few things I would recommend you consider. 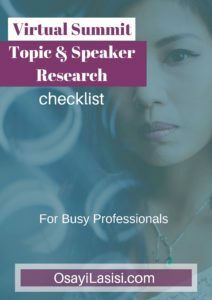 Where do you need to research to pick the best topic for you? Once you’ve created your checklist, make sure you use it. Use it when you’re not sure what’s the next step. Use it to confirm that you’re sure what the next step. And tweak it when you see that there is a more efficient way of doing things.